A food bank that provides food to needy children in San Diego received a very special holiday gift this year thanks to a local benevolent organization: A forklift. 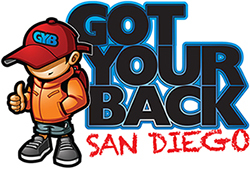 Got Your Back San Diego is a privately funded meal program that provides food to needy children over the weekends, when they can’t benefit from free school lunch programs. The program provides six meals and two snacks to 180 homeless and needy children who go to school in the Oceanside and Vista school districts in Southern California. The group’s executive director, Ceci Haas, recently spoke during a meeting of the Carlsbad Optimists club. During her talk, she explained her organization’s mission and how it was helping impoverished children right in the group’s own backyard. For some Optimists members, Haas’ speech really hit home. Haas was asked how the Optimists could help support the organization’s cause. Haas explained that Got Your Back San Diego had a need for a forklift that could be used to stock food donations on the upper shelves of its small food pantry warehouse, located in Oceanside. The Optimists, led by member Joe Tosto, went to work. The group contacted Otay Mesa Sales, a local heavy equipment sales and leasing company, and convinced the business to contribute a forklift to the charity. Bill McLeod, Got Your Back San Diego’s co-founder, said the Optimists’ gift will truly make a difference in the lives of many children in need in the San Diego area. It also has improved safety and efficiency at the group’s warehouse. “After four years of working on rickety ladders, that lift has dramatically increased our functionality and improved safe working conditions more than I imagined,” McLeod said. Got Your Back San Diego is part of a nonprofit umbrella group known as the American Relief Organization, which was founded by Susan McLeod, a direct marketing entrepreneur, and her husband Bill McLeod, owner of Oceanside-based AMI Environmental Testing. The group may be best known for its backpack program. Each week during the school year, volunteers at the charity’s warehouse fill backpacks with enough food to feed a child breakfast, lunch and dinner for to days. The pack also includes information about food and nutrition that can benefit the child for life. The backpacks are delivered to schools where they are needed. There, a designated person from each school distributes full backpacks to children who need them and collects empty backpacks from the week before. According to Got Your Back San Diego, more than 16,000 children in the San Diego school system depend on the free school lunch program as their primary source of food on weekdays, when school is in session. The forklift donated by Otay Mesa Sales that was arranged by the Optimists will make Got Your Back San Diego’s program more efficient, effective and safe.